Thank you for your interest in one of Mercedes Benz of Massapequa's online offerings. Please continue for more information regarding this 2015 Mercedes-Benz CLA-Class CLA 250 with 44,146mi. This Mercedes-Benz includes: REAR SPOILER (PIO) Rear Spoiler PREMIUM 1 PACKAGE HD Radio Auto-Dimming Rearview Mirror Universal Garage Door Opener Heated Front Seat(s) Satellite Radio Power Door Locks Keyless Entry Premium Sound System REARVIEW CAMERA Back-Up Camera PANORAMA SUNROOF Generic Sun/Moonroof Sun/Moonroof Dual Moonroof ALUMINUM TRIM *Note - For third party subscriptions or services, please contact the dealer for more information. * CARFAX BuyBack Guarantee is reassurance that any major issues with this vehicle will show on CARFAX report. The CARFAX report for this 2015 Mercedes-Benz CLA-Class CLA 250 highlights that it's a One-Owner vehicle, and for good reason. A One-Owner vehicle gives you the feel of owning a new vehicle without paying the new car price. This a worry-free vehicle that has passed our certification process. Outstanding fuel economy and sleek styling are two great reasons to consider this Mercedes-Benz CLA-Class. Enjoy the grip and control of AWD performance in this nicely equipped Mercedes-Benz CLA-Class. This low mileage Mercedes-Benz CLA-Class has barely been touched. It's the next best thing to buying new. More information about the 2015 Mercedes-Benz CLA-Class: The CLA-Class is Mercedes-Benz's attempt to compete with the likes of the diminutive Audi A3 and the BMW 1-series. As the price of gasoline continues to rise, compact luxury cars get more and more popular. Buyers will continue to want all of the technology and luxury features of larger cars without the size or fuel consumption. Mercedes-Benz hopes that attractive styling, a low base price, an upscale name and lots of luxury know-how will be enough to convince buyers to take a serious look at the CLA-Class. Strengths of this model include Efficient usage of space, beautiful styling, economical pricing, good performance, optional all-wheel drive Payments based on maximum finance term available and Tier 1 credit approval. 20% Cash or trade down. Tax,DMV additional.Thank you for your interest in one of Mercedes Benz of Massapequa's online offerings. Please continue for more information regarding this 2015 Mercedes-Benz CLA-Class CLA 250 with 44,146mi. This Mercedes-Benz includes: REAR SPOILER (PIO) Rear Spoiler PREMIUM 1 PACKAGE HD Radio Auto-Dimming Rearview Mirror Universal Garage Door Opener Heated Front Seat(s) Satellite Radio Power Door Locks Keyless Entry Premium Sound System REARVIEW CAMERA Back-Up Camera PANORAMA SUNROOF Generic Sun/Moonroof Sun/Moonroof Dual Moonroof ALUMINUM TRIM *Note - For third party subscriptions or services, please contact the dealer for more information. * CARFAX BuyBack Guarantee is reassurance that any major issues with this vehicle will show on CARFAX report. The CARFAX report for this 2015 Mercedes-Benz CLA-Class CLA 250 highlights that it's a One-Owner vehicle, and for good reason. A One-Owner vehicle gives you the feel of owning a new vehicle without paying the new car price. This a worry-free vehicle that has passed our certification process. Outstanding fuel economy and sleek styling are two great reasons to consider this Mercedes-Benz CLA-Class. Enjoy the grip and control of AWD performance in this nicely equipped Mercedes-Benz CLA-Class. This low mileage Mercedes-Benz CLA-Class has barely been touched. It's the next best thing to buying new. More information about the 2015 Mercedes-Benz CLA-Class: The CLA-Class is Mercedes-Benz's attempt to compete with the likes of the diminutive Audi A3 and the BMW 1-series. As the price of gasoline continues to rise, compact luxury cars get more and more popular. Buyers will continue to want all of the technology and luxury features of larger cars without the size or fuel consumption. Mercedes-Benz hopes that attractive styling, a low base price, an upscale name and lots of luxury know-how will be enough to convince buyers to take a serious look at the CLA-Class. Strengths of this model include Efficient usage of space, beautiful styling, economical pricing, good performance, optional all-wheel drive Payments based on maximum finance term available and Tier 1 credit approval. 20% Cash or trade down. Tax,DMV additional. 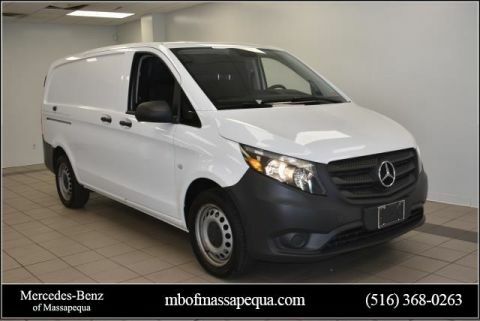 This 2018 Mercedes-Benz Metris Cargo Van Worker is offered to you for sale by Mercedes Benz of Massapequa. This Mercedes-Benz includes: CONVENIENCE PACKAGE Variable Speed Intermittent Wipers Power Mirror(s) Intermittent Wipers Heated Mirrors Cruise Control Rain Sensing Wipers *Note - For third party subscriptions or services, please contact the dealer for more information. * Only the CARFAX Buyback Guarantee can offer you the comfort of knowing you made the right purchase. A test drive can only tell you so much. Get all the info when you purchase a vehicle like this with a CARFAX one-owner report. 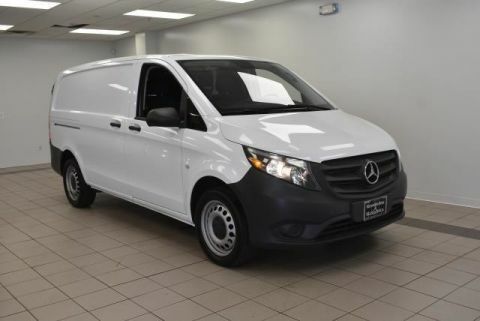 Enjoy the comfort of knowing this Mercedes-Benz Metris Cargo Van comes equipped with a manufacturer's warranty. Payments based on maximum finance term available and Tier 1 credit approval. 20% Cash or trade down. Tax,DMV additional.This 2018 Mercedes-Benz Metris Cargo Van Worker is offered to you for sale by Mercedes Benz of Massapequa. This Mercedes-Benz includes: CONVENIENCE PACKAGE Variable Speed Intermittent Wipers Power Mirror(s) Intermittent Wipers Heated Mirrors Cruise Control Rain Sensing Wipers *Note - For third party subscriptions or services, please contact the dealer for more information. * Only the CARFAX Buyback Guarantee can offer you the comfort of knowing you made the right purchase. A test drive can only tell you so much. Get all the info when you purchase a vehicle like this with a CARFAX one-owner report. 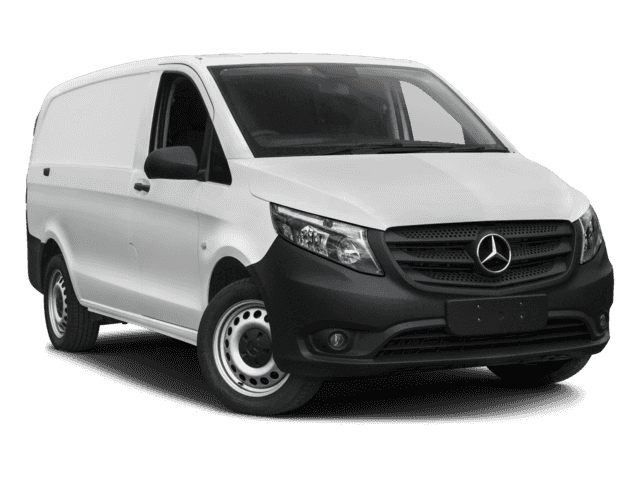 Enjoy the comfort of knowing this Mercedes-Benz Metris Cargo Van comes equipped with a manufacturer's warranty. Payments based on maximum finance term available and Tier 1 credit approval. 20% Cash or trade down. Tax,DMV additional. Looking for a clean, well-cared for 2015 Mercedes-Benz C-Class? This is it. This Mercedes-Benz includes: REAR VIEW CAMERA HEATED FRONT SEATS PREMIUM 1 PACKAGE BLIND SPOT ASSIST PANORAMA SUNROOF WHEELS: 18 5-SPOKE *Note - For third party subscriptions or services, please contact the dealer for more information. * Drive home in your new pre-owned vehicle with the knowledge you're fully backed by the CARFAX Buyback Guarantee. CARFAX shows that this is a one-owner vehicle -- no wonder it's in such great condition. Meticulously inspected -- Worry-free -- Quality assured. All of this comes with a Certified vehicle, like this 2015 Mercedes-Benz. There's a level of quality and refinement in this Mercedes-Benz C-Class that you won't find in your average vehicle. The less money you spend at the pump, the more money you'll have to spend on you. So why not consider this wonderfully styled, fuel-efficient Mercedes-Benz C-Class. Few vehicles can match the safety and comfort of this AWD Mercedes-Benz C-Class C 300 Sport. With enhanced performance, refined interior and exceptional fuel efficiency, this AWD Mercedes-Benz is in a class of its own. The C-Class C 300 Sport has been lightly driven and there is little to no wear and tear on this vehicle. The care taken on this gently used vehicle is reflective of the 35,570mi put on this Mercedes-Benz. More information about the 2015 Mercedes-Benz C-Class: The C-Class has traditionally been Mercedes-Benz' entry-level car. However with the arrival of the CLA, the C-Class is no longer the German automaker's least expensive model. Mercedes-Benz has packed the 2015 C-Class full of upscale technology, determined to make the car feel anything but entry level. Despite this move upmarket, pricing on the C-Class remains competitive with other European small sedans such as the BMW 3-series. The 2015 C-Class starts at around $40,000. Strengths of this model include Attractive modern styling, powerful turbocharged engines, Typical Mercedes luxury, all-wheel drive, and high end features Payments based on maximum finance term available and Tier 1 credit approval. 20% Cash or trade down. Tax,DMV additional.Looking for a clean, well-cared for 2015 Mercedes-Benz C-Class? This is it. This Mercedes-Benz includes: REAR VIEW CAMERA HEATED FRONT SEATS PREMIUM 1 PACKAGE BLIND SPOT ASSIST PANORAMA SUNROOF WHEELS: 18 5-SPOKE *Note - For third party subscriptions or services, please contact the dealer for more information. * Drive home in your new pre-owned vehicle with the knowledge you're fully backed by the CARFAX Buyback Guarantee. CARFAX shows that this is a one-owner vehicle -- no wonder it's in such great condition. Meticulously inspected -- Worry-free -- Quality assured. All of this comes with a Certified vehicle, like this 2015 Mercedes-Benz. There's a level of quality and refinement in this Mercedes-Benz C-Class that you won't find in your average vehicle. The less money you spend at the pump, the more money you'll have to spend on you. So why not consider this wonderfully styled, fuel-efficient Mercedes-Benz C-Class. Few vehicles can match the safety and comfort of this AWD Mercedes-Benz C-Class C 300 Sport. With enhanced performance, refined interior and exceptional fuel efficiency, this AWD Mercedes-Benz is in a class of its own. The C-Class C 300 Sport has been lightly driven and there is little to no wear and tear on this vehicle. The care taken on this gently used vehicle is reflective of the 35,570mi put on this Mercedes-Benz. More information about the 2015 Mercedes-Benz C-Class: The C-Class has traditionally been Mercedes-Benz' entry-level car. However with the arrival of the CLA, the C-Class is no longer the German automaker's least expensive model. Mercedes-Benz has packed the 2015 C-Class full of upscale technology, determined to make the car feel anything but entry level. Despite this move upmarket, pricing on the C-Class remains competitive with other European small sedans such as the BMW 3-series. The 2015 C-Class starts at around $40,000. Strengths of this model include Attractive modern styling, powerful turbocharged engines, Typical Mercedes luxury, all-wheel drive, and high end features Payments based on maximum finance term available and Tier 1 credit approval. 20% Cash or trade down. Tax,DMV additional. 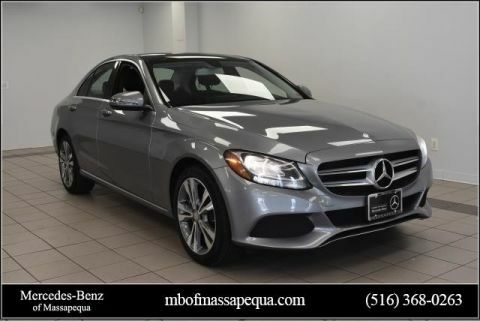 Contact Mercedes Benz of Massapequa today for information on dozens of vehicles like this 2016 Mercedes-Benz C-Class C 300 Sport. This Mercedes-Benz includes: ILLUMINATED STAR REAR TRUNK LID SPOILER PANORAMA SUNROOF REAR VIEW CAMERA MULTIMEDIA PACKAGE PREMIUM 2 PACKAGE BLIND SPOT ASSIST HEATED STEERING WHEEL Heated Steering Wheel *Note - For third party subscriptions or services, please contact the dealer for more information. * Your buying risks are reduced thanks to a CARFAX BuyBack Guarantee. This is a well kept ONE-OWNER Mercedes-Benz C-Class C 300 Sport with a full CARFAX history report. This vehicle has passed our highest inspection standards and is therefore awarded a Certified status. Is it possible to fall in love with a vehicle? It is when your vehicle is as prestige as the Mercedes-Benz C-Class. This vehicle was engineered to be both economically and environmentally friendly with exceptional fuel efficiency. Navigate through all the icky weather with ease in this AWD-equipped Mercedes-Benz C-Class, and even get non-stop traction for your non-stop lifestyle! In addition to the amazing traction control, you may even qualify for an insurance reduction with this AWD vehicle. One of the best things about this Mercedes-Benz C-Class is that it has low, low mileage. It's ready for you to truly break it in. Enjoy the comfort of knowing this Mercedes-Benz C-Class comes equipped with a manufacturer's warranty. This Mercedes-Benz C-Class offers the most up-to-date navigation system available so you'll always know the most efficient route to where you are going. More information about the 2016 Mercedes-Benz C-Class: The C-Class has traditionally been Mercedes-Benz' entry-level car. However, with the arrival of the CLA, the C-Class is no longer the German automaker's least expensive model. Mercedes-Benz has packed the 2016 C-Class full of upscale technology, determined to make the car feel anything but entry level. Despite this move upmarket, pricing on the C-Class remains competitive with other European small sedans such as the BMW 3-series. The 2016 C-Class starts at around $40,000. Interesting features of this model are high-end features, all-wheel drive, Attractive modern styling, fuel-efficient diesel and hybrid engines, plus powerful turbocharged engines, and typical Mercedes-Benz luxury Payments based on maximum finance term available and Tier 1 credit approval. 20% Cash or trade down. 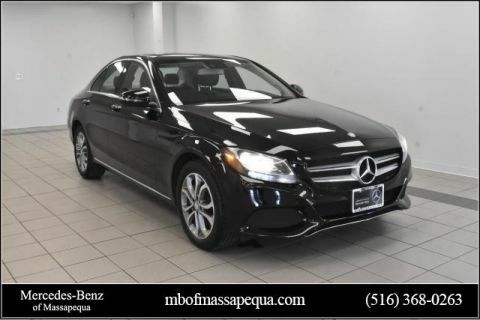 Tax,DMV additional.Contact Mercedes Benz of Massapequa today for information on dozens of vehicles like this 2016 Mercedes-Benz C-Class C 300 Sport. This Mercedes-Benz includes: ILLUMINATED STAR REAR TRUNK LID SPOILER PANORAMA SUNROOF REAR VIEW CAMERA MULTIMEDIA PACKAGE PREMIUM 2 PACKAGE BLIND SPOT ASSIST HEATED STEERING WHEEL Heated Steering Wheel *Note - For third party subscriptions or services, please contact the dealer for more information. * Your buying risks are reduced thanks to a CARFAX BuyBack Guarantee. This is a well kept ONE-OWNER Mercedes-Benz C-Class C 300 Sport with a full CARFAX history report. This vehicle has passed our highest inspection standards and is therefore awarded a Certified status. Is it possible to fall in love with a vehicle? It is when your vehicle is as prestige as the Mercedes-Benz C-Class. This vehicle was engineered to be both economically and environmentally friendly with exceptional fuel efficiency. Navigate through all the icky weather with ease in this AWD-equipped Mercedes-Benz C-Class, and even get non-stop traction for your non-stop lifestyle! In addition to the amazing traction control, you may even qualify for an insurance reduction with this AWD vehicle. One of the best things about this Mercedes-Benz C-Class is that it has low, low mileage. It's ready for you to truly break it in. Enjoy the comfort of knowing this Mercedes-Benz C-Class comes equipped with a manufacturer's warranty. This Mercedes-Benz C-Class offers the most up-to-date navigation system available so you'll always know the most efficient route to where you are going. More information about the 2016 Mercedes-Benz C-Class: The C-Class has traditionally been Mercedes-Benz' entry-level car. However, with the arrival of the CLA, the C-Class is no longer the German automaker's least expensive model. Mercedes-Benz has packed the 2016 C-Class full of upscale technology, determined to make the car feel anything but entry level. Despite this move upmarket, pricing on the C-Class remains competitive with other European small sedans such as the BMW 3-series. The 2016 C-Class starts at around $40,000. Interesting features of this model are high-end features, all-wheel drive, Attractive modern styling, fuel-efficient diesel and hybrid engines, plus powerful turbocharged engines, and typical Mercedes-Benz luxury Payments based on maximum finance term available and Tier 1 credit approval. 20% Cash or trade down. Tax,DMV additional. 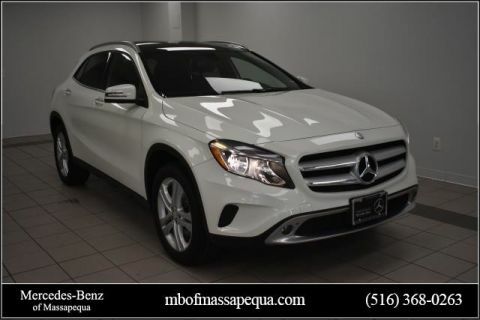 Mercedes Benz of Massapequa is excited to offer this 2015 Mercedes-Benz GLA-Class. This Mercedes-Benz includes: PANORAMA SUNROOF Generic Sun/Moonroof Sun/Moonroof Dual Moonroof PREMIUM PACKAGE Multi-Zone A/C HD Radio A/C Universal Garage Door Opener Heated Front Seat(s) Satellite Radio Premium Sound System Auxiliary Audio Input MP3 Player MULTIMEDIA PACKAGE Navigation System CD Player Back-Up Camera Hard Disk Drive Media Storage MP3 Player BLIND SPOT ASSIST Blind Spot Monitor *Note - For third party subscriptions or services, please contact the dealer for more information. * This vehicle is loaded with great features, plus it comes with the CARFAX BuyBack Guarantee. Certified Pre-Owned means certified peace of mind. Off-road or on the street, this Mercedes-Benz GLA-Class GLA 250 handles with ease. Once you see this Mercedes-Benz, you'll quickly see that this is the perfect vehicle for the outdoor junky! You'll even feel relaxed knowing that this All-Wheel drive vehicle will get you to where you are going no matter what may come your way. Also, with this Mercedes-Benz GLA-Class's dependable control you'll be able to drive into the sunset without a care in the world! In addition to being well-cared for, this Mercedes-Benz GLA-Class has very low mileage making it a rare find. You'll quickly realize how much you will need a navigation system once you are stopping for directions or looking up addresses on your phone instead of looking at the road. This Mercedes-Benz GLA-Class GLA 250 features a navigation system that will free you of these unnecessary headaches. Price. Performance. Protection. This vehicle has it all, including a manufacturer's warranty. This highly refined Mercedes-Benz GLA-Class comes with exciting features you'd expect in a vehicle twice the price. More information about the 2015 Mercedes-Benz GLA-Class: Mercedes-Benz enters the increasingly crowded luxury compact crossover segment with the GLA-Class. Its sedan underpinnings and small stature make it a nimble performer, with favorable comparison against completion from BMW and Audi. The high-performance GLA 45 AMG® takes things to a different level, however, and nothing from any manufacturer can rival it. Interesting features of this model are superb power in AMG® guise, available technology and safety features, athletic handling, and Overall execution feels upscale and exclusive Payments based on maximum finance term available and Tier 1 credit approval. 20% Cash or trade down. 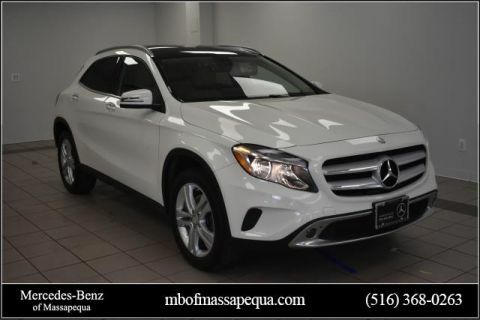 Tax,DMV additional.Mercedes Benz of Massapequa is excited to offer this 2015 Mercedes-Benz GLA-Class. This Mercedes-Benz includes: PANORAMA SUNROOF Generic Sun/Moonroof Sun/Moonroof Dual Moonroof PREMIUM PACKAGE Multi-Zone A/C HD Radio A/C Universal Garage Door Opener Heated Front Seat(s) Satellite Radio Premium Sound System Auxiliary Audio Input MP3 Player MULTIMEDIA PACKAGE Navigation System CD Player Back-Up Camera Hard Disk Drive Media Storage MP3 Player BLIND SPOT ASSIST Blind Spot Monitor *Note - For third party subscriptions or services, please contact the dealer for more information. * This vehicle is loaded with great features, plus it comes with the CARFAX BuyBack Guarantee. Certified Pre-Owned means certified peace of mind. Off-road or on the street, this Mercedes-Benz GLA-Class GLA 250 handles with ease. Once you see this Mercedes-Benz, you'll quickly see that this is the perfect vehicle for the outdoor junky! You'll even feel relaxed knowing that this All-Wheel drive vehicle will get you to where you are going no matter what may come your way. Also, with this Mercedes-Benz GLA-Class's dependable control you'll be able to drive into the sunset without a care in the world! In addition to being well-cared for, this Mercedes-Benz GLA-Class has very low mileage making it a rare find. You'll quickly realize how much you will need a navigation system once you are stopping for directions or looking up addresses on your phone instead of looking at the road. This Mercedes-Benz GLA-Class GLA 250 features a navigation system that will free you of these unnecessary headaches. Price. Performance. Protection. This vehicle has it all, including a manufacturer's warranty. This highly refined Mercedes-Benz GLA-Class comes with exciting features you'd expect in a vehicle twice the price. More information about the 2015 Mercedes-Benz GLA-Class: Mercedes-Benz enters the increasingly crowded luxury compact crossover segment with the GLA-Class. Its sedan underpinnings and small stature make it a nimble performer, with favorable comparison against completion from BMW and Audi. The high-performance GLA 45 AMG® takes things to a different level, however, and nothing from any manufacturer can rival it. Interesting features of this model are superb power in AMG® guise, available technology and safety features, athletic handling, and Overall execution feels upscale and exclusive Payments based on maximum finance term available and Tier 1 credit approval. 20% Cash or trade down. Tax,DMV additional. 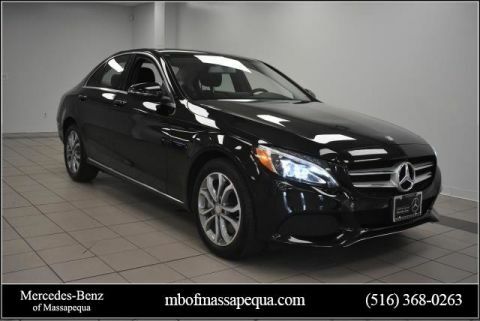 Contact Mercedes Benz of Massapequa today for information on dozens of vehicles like this 2016 Mercedes-Benz C-Class C 300 Sport. This Mercedes-Benz includes: HEATED FRONT SEATS PANORAMA SUNROOF REAR VIEW CAMERA PREMIUM 1 PACKAGE BLIND SPOT ASSIST *Note - For third party subscriptions or services, please contact the dealer for more information. * Drive home in your new pre-owned vehicle with the knowledge you're fully backed by the CARFAX Buyback Guarantee. This vehicle has surpassed all inspections to achieve Certified Pre-Owned status. There's a level of quality and refinement in this Mercedes-Benz C-Class that you won't find in your average vehicle. You could spend more on fuel each month than on your vehicle payments, so why not consider one with exceptional fuel economy like this 2016 Mercedes-Benz C-Class. Few vehicles can match the safety and comfort of this AWD Mercedes-Benz C-Class C 300 Sport. With enhanced performance, refined interior and exceptional fuel efficiency, this AWD Mercedes-Benz is in a class of its own. In addition to being well-cared for, this Mercedes-Benz C-Class has very low mileage making it a rare find. This Mercedes-Benz C-Class is well-equipped, well-cared for and still covered under the manufacture's factory warranty. The upgraded wheels on this vehicle offer improved handling and an attractive appearance. More information about the 2016 Mercedes-Benz C-Class: The C-Class has traditionally been Mercedes-Benz' entry-level car. However, with the arrival of the CLA, the C-Class is no longer the German automaker's least expensive model. Mercedes-Benz has packed the 2016 C-Class full of upscale technology, determined to make the car feel anything but entry level. Despite this move upmarket, pricing on the C-Class remains competitive with other European small sedans such as the BMW 3-series. The 2016 C-Class starts at around $40,000. Interesting features of this model are high-end features, all-wheel drive, Attractive modern styling, fuel-efficient diesel and hybrid engines, plus powerful turbocharged engines, and typical Mercedes-Benz luxury Payments based on maximum finance term available and Tier 1 credit approval. 20% Cash or trade down. 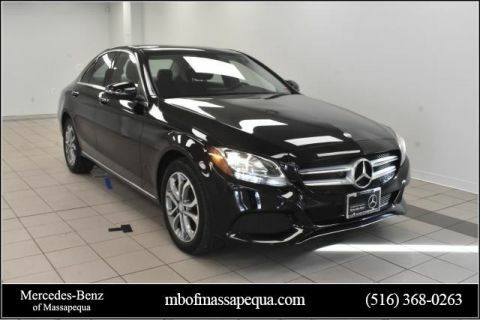 Tax,DMV additional.Contact Mercedes Benz of Massapequa today for information on dozens of vehicles like this 2016 Mercedes-Benz C-Class C 300 Sport. This Mercedes-Benz includes: HEATED FRONT SEATS PANORAMA SUNROOF REAR VIEW CAMERA PREMIUM 1 PACKAGE BLIND SPOT ASSIST *Note - For third party subscriptions or services, please contact the dealer for more information. * Drive home in your new pre-owned vehicle with the knowledge you're fully backed by the CARFAX Buyback Guarantee. This vehicle has surpassed all inspections to achieve Certified Pre-Owned status. There's a level of quality and refinement in this Mercedes-Benz C-Class that you won't find in your average vehicle. You could spend more on fuel each month than on your vehicle payments, so why not consider one with exceptional fuel economy like this 2016 Mercedes-Benz C-Class. Few vehicles can match the safety and comfort of this AWD Mercedes-Benz C-Class C 300 Sport. With enhanced performance, refined interior and exceptional fuel efficiency, this AWD Mercedes-Benz is in a class of its own. In addition to being well-cared for, this Mercedes-Benz C-Class has very low mileage making it a rare find. This Mercedes-Benz C-Class is well-equipped, well-cared for and still covered under the manufacture's factory warranty. The upgraded wheels on this vehicle offer improved handling and an attractive appearance. More information about the 2016 Mercedes-Benz C-Class: The C-Class has traditionally been Mercedes-Benz' entry-level car. However, with the arrival of the CLA, the C-Class is no longer the German automaker's least expensive model. Mercedes-Benz has packed the 2016 C-Class full of upscale technology, determined to make the car feel anything but entry level. Despite this move upmarket, pricing on the C-Class remains competitive with other European small sedans such as the BMW 3-series. The 2016 C-Class starts at around $40,000. Interesting features of this model are high-end features, all-wheel drive, Attractive modern styling, fuel-efficient diesel and hybrid engines, plus powerful turbocharged engines, and typical Mercedes-Benz luxury Payments based on maximum finance term available and Tier 1 credit approval. 20% Cash or trade down. Tax,DMV additional. Thank you for your interest in one of Mercedes Benz of Massapequa's online offerings. Please continue for more information regarding this 2016 Mercedes-Benz C-Class C 300 Sport with 23,989mi. This Mercedes-Benz includes: HEATED FRONT SEATS REAR TRUNK LID SPOILER ROLLER SUNBLINDS FOR REAR WINDOWS (MANUAL) PANORAMA SUNROOF REAR VIEW CAMERA PREMIUM 1 PACKAGE BLIND SPOT ASSIST *Note - For third party subscriptions or services, please contact the dealer for more information. * This vehicle is loaded with great features, plus it comes with the CARFAX BuyBack Guarantee. The CARFAX report shows this Mercedes-Benz C-Class is a well cared for One-Owner vehicle. This vehicle has passed our highest inspection standards and is therefore awarded a Certified status. Put performance, safety, beauty, sophistication and all the right amenities into a car, and here it is! Now you can own luxury without the luxury price tag! Stylish and fuel efficient. It's the perfect vehicle for keeping your fuel costs down and your driving enjoying up. This Mercedes-Benz C-Class is equipped with AWD for improved handling. Whether you're faced with inclement weather or just out enjoying the twisting back road, you'll have the grip of AWD on your side. The incredibly low mileage and painstaking upkeep on this Mercedes-Benz C-Class makes it a once-in-a-lifetime deal that won't last long! Call us today to reserve your test drive! A vehicle as well-maintained as this Mercedes-Benz C-Class almost doesn't need a warranty, but you rest easier knowing it comes covered with the Mercedes-Benz factory warranty. More information about the 2016 Mercedes-Benz C-Class: The C-Class has traditionally been Mercedes-Benz' entry-level car. However, with the arrival of the CLA, the C-Class is no longer the German automaker's least expensive model. Mercedes-Benz has packed the 2016 C-Class full of upscale technology, determined to make the car feel anything but entry level. Despite this move upmarket, pricing on the C-Class remains competitive with other European small sedans such as the BMW 3-series. The 2016 C-Class starts at around $40,000. Interesting features of this model are high-end features, all-wheel drive, Attractive modern styling, fuel-efficient diesel and hybrid engines, plus powerful turbocharged engines, and typical Mercedes-Benz luxury Payments based on maximum finance term available and Tier 1 credit approval. 20% Cash or trade down. Tax,DMV additional.Thank you for your interest in one of Mercedes Benz of Massapequa's online offerings. Please continue for more information regarding this 2016 Mercedes-Benz C-Class C 300 Sport with 23,989mi. This Mercedes-Benz includes: HEATED FRONT SEATS REAR TRUNK LID SPOILER ROLLER SUNBLINDS FOR REAR WINDOWS (MANUAL) PANORAMA SUNROOF REAR VIEW CAMERA PREMIUM 1 PACKAGE BLIND SPOT ASSIST *Note - For third party subscriptions or services, please contact the dealer for more information. * This vehicle is loaded with great features, plus it comes with the CARFAX BuyBack Guarantee. The CARFAX report shows this Mercedes-Benz C-Class is a well cared for One-Owner vehicle. This vehicle has passed our highest inspection standards and is therefore awarded a Certified status. Put performance, safety, beauty, sophistication and all the right amenities into a car, and here it is! Now you can own luxury without the luxury price tag! Stylish and fuel efficient. It's the perfect vehicle for keeping your fuel costs down and your driving enjoying up. This Mercedes-Benz C-Class is equipped with AWD for improved handling. Whether you're faced with inclement weather or just out enjoying the twisting back road, you'll have the grip of AWD on your side. The incredibly low mileage and painstaking upkeep on this Mercedes-Benz C-Class makes it a once-in-a-lifetime deal that won't last long! Call us today to reserve your test drive! A vehicle as well-maintained as this Mercedes-Benz C-Class almost doesn't need a warranty, but you rest easier knowing it comes covered with the Mercedes-Benz factory warranty. More information about the 2016 Mercedes-Benz C-Class: The C-Class has traditionally been Mercedes-Benz' entry-level car. However, with the arrival of the CLA, the C-Class is no longer the German automaker's least expensive model. Mercedes-Benz has packed the 2016 C-Class full of upscale technology, determined to make the car feel anything but entry level. Despite this move upmarket, pricing on the C-Class remains competitive with other European small sedans such as the BMW 3-series. The 2016 C-Class starts at around $40,000. Interesting features of this model are high-end features, all-wheel drive, Attractive modern styling, fuel-efficient diesel and hybrid engines, plus powerful turbocharged engines, and typical Mercedes-Benz luxury Payments based on maximum finance term available and Tier 1 credit approval. 20% Cash or trade down. Tax,DMV additional. Thank you for visiting another one of Mercedes Benz of Massapequa's online listings! Please continue for more information on this 2016 Mercedes-Benz C-Class C 300 with 38,966mi. This Mercedes-Benz includes: ILLUMINATED STAR PREMIUM 2 PACKAGE MULTIMEDIA PACKAGE PANORAMA SUNROOF BLIND SPOT ASSIST BURL WALNUT WOOD TRIM HEATED FRONT SEATS REAR VIEW CAMERA *Note - For third party subscriptions or services, please contact the dealer for more information. * Drive home in your new pre-owned vehicle with the knowledge you're fully backed by the CARFAX Buyback Guarantee. This is a well kept ONE-OWNER Mercedes-Benz C-Class C 300 with a full CARFAX history report. 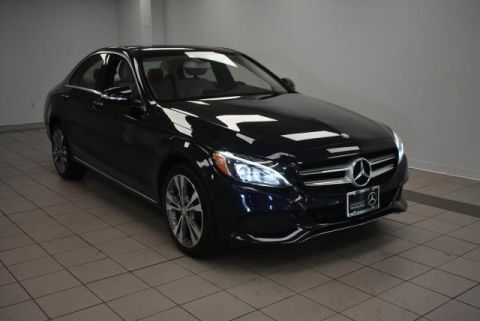 Reliability is something you can count on when you purchase a Certified Pre-Owned vehicle like this Mercedes-Benz C-Class C 300. This Mercedes-Benz C-Class C 300's level of quality is not meant for just anyone. It's meant for the person who strives for a classy, comfortable, and luxurious car. This 2016 Mercedes-Benz C-Class has great acceleration and wonderful styling without sacrificing exceptional fuel economy. All-wheel drive means peace of mind all the time. This Polar White AWD Mercedes-Benz enjoys a host offeatures, including exceptional acceleration and superior stability so you can drive with confidence. You can tell this 2016 Mercedes-Benz C-Class has been pampered by the fact that it has less than 38,966mi and appears with a showroom shine. Price. Performance. Protection. This vehicle has it all, including a manufacturer's warranty. This 2016 C-Class C 300 has extra options like the Mercedes-Benz navigation system. The additional feature will keep you safe and will make this Mercedes-Benz C-Class even more dependable. More information about the 2016 Mercedes-Benz C-Class: The C-Class has traditionally been Mercedes-Benz' entry-level car. However, with the arrival of the CLA, the C-Class is no longer the German automaker's least expensive model. Mercedes-Benz has packed the 2016 C-Class full of upscale technology, determined to make the car feel anything but entry level. Despite this move upmarket, pricing on the C-Class remains competitive with other European small sedans such as the BMW 3-series. The 2016 C-Class starts at around $40,000. This model sets itself apart with high-end features, all-wheel drive, Attractive modern styling, fuel-efficient diesel and hybrid engines, plus powerful turbocharged engines, and typical Mercedes-Benz luxury Payments based on maximum finance term available and Tier 1 credit approval. 20% Cash or trade down. Tax,DMV additional.Thank you for visiting another one of Mercedes Benz of Massapequa's online listings! Please continue for more information on this 2016 Mercedes-Benz C-Class C 300 with 38,966mi. This Mercedes-Benz includes: ILLUMINATED STAR PREMIUM 2 PACKAGE MULTIMEDIA PACKAGE PANORAMA SUNROOF BLIND SPOT ASSIST BURL WALNUT WOOD TRIM HEATED FRONT SEATS REAR VIEW CAMERA *Note - For third party subscriptions or services, please contact the dealer for more information. * Drive home in your new pre-owned vehicle with the knowledge you're fully backed by the CARFAX Buyback Guarantee. This is a well kept ONE-OWNER Mercedes-Benz C-Class C 300 with a full CARFAX history report. Reliability is something you can count on when you purchase a Certified Pre-Owned vehicle like this Mercedes-Benz C-Class C 300. This Mercedes-Benz C-Class C 300's level of quality is not meant for just anyone. It's meant for the person who strives for a classy, comfortable, and luxurious car. This 2016 Mercedes-Benz C-Class has great acceleration and wonderful styling without sacrificing exceptional fuel economy. All-wheel drive means peace of mind all the time. This Polar White AWD Mercedes-Benz enjoys a host offeatures, including exceptional acceleration and superior stability so you can drive with confidence. You can tell this 2016 Mercedes-Benz C-Class has been pampered by the fact that it has less than 38,966mi and appears with a showroom shine. Price. Performance. Protection. This vehicle has it all, including a manufacturer's warranty. 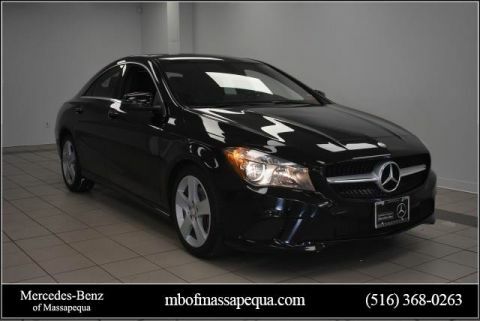 This 2016 C-Class C 300 has extra options like the Mercedes-Benz navigation system. The additional feature will keep you safe and will make this Mercedes-Benz C-Class even more dependable. More information about the 2016 Mercedes-Benz C-Class: The C-Class has traditionally been Mercedes-Benz' entry-level car. However, with the arrival of the CLA, the C-Class is no longer the German automaker's least expensive model. Mercedes-Benz has packed the 2016 C-Class full of upscale technology, determined to make the car feel anything but entry level. Despite this move upmarket, pricing on the C-Class remains competitive with other European small sedans such as the BMW 3-series. The 2016 C-Class starts at around $40,000. This model sets itself apart with high-end features, all-wheel drive, Attractive modern styling, fuel-efficient diesel and hybrid engines, plus powerful turbocharged engines, and typical Mercedes-Benz luxury Payments based on maximum finance term available and Tier 1 credit approval. 20% Cash or trade down. Tax,DMV additional. Mercedes Benz of Massapequa has a wide selection of exceptional pre-owned vehicles to choose from, including this 2016 Mercedes-Benz GLA. This Mercedes-Benz includes: BURL WALNUT WOOD TRIM Woodgrain Interior Trim PREMIUM PACKAGE HD Radio Universal Garage Door Opener Heated Front Seat(s) Satellite Radio Power Door Locks Keyless Entry Premium Sound System PANORAMA SUNROOF Generic Sun/Moonroof Sun/Moonroof Dual Moonroof MULTI-MEDIA WITH SMARTPHONE Navigation System CD Player Back-Up Camera Bluetooth® Connection Entertainment System BLIND SPOT ASSIST Blind Spot Monitor *Note - For third party subscriptions or services, please contact the dealer for more information. * When you purchase a vehicle with the CARFAX Buyback Guarantee, you're getting what you paid for. Why does this vehicle look so great? The CARFAX report shows it's only been owned by one owner. Why own a car when you can own a lifestyle? 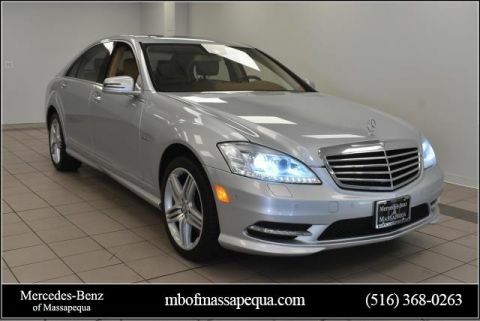 We at Mercedes Benz of Massapequa offer you nothing less than the best with our Certified Pre-Owned vehicles. This vehicle meets Mercedes-Benz's highest level of standards, allowing us to provide you with what you deserve. Want more room? Want more style? This Mercedes-Benz GLA is the vehicle for you. The impressive Mercedes-Benz fuel-efficiency will make you quickly realize what you've been missing out on in life. It's noteworthy fuel economy and minimal emissions make this vehicle's value a cut above the rest. Simply put, this all wheel drive vehicle is engineered with higher standards. Enjoy improved steering, superior acceleration, and increased stability and safety while driving this AWD Mercedes-BenzGLA GLA 250. You can tell this 2016 Mercedes-Benz GLA has been pampered by the fact that it has less than 28,735mi and appears with a showroom shine. Treat your family to the joy of a vehicle with a super premium entertainment package like the one found in this vehicle. With an efficient and easy to use navigation system, this Mercedes-Benz GLA will help get you from Point A to Point B in no time flat. This finely crafted vehicle is engineered to last. But just in case it doesn't, you can take comfort knowing it comes with a manufacturer's warranty. More information about the 2016 Mercedes-Benz GLA: Mercedes-Benz enters the increasingly crowded luxury compact crossover segment with the GLA-Class. Its sedan underpinnings and small stature make it a nimble performer, with favorable comparison against competition from BMW and Audi. The high-performance GLA 45 AMG® takes things to a different level, however, and nothing from any manufacturer can rival it. Strengths of this model include athletic handling, superb power in AMG® guise, and Available technology and safety features Payments based on maximum finance term available and Tier 1 credit approval. 20% Cash or trade down. 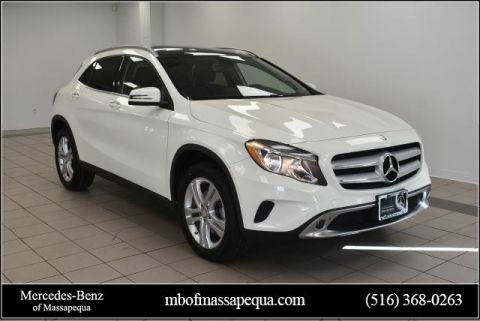 Tax,DMV additional.Mercedes Benz of Massapequa has a wide selection of exceptional pre-owned vehicles to choose from, including this 2016 Mercedes-Benz GLA. This Mercedes-Benz includes: BURL WALNUT WOOD TRIM Woodgrain Interior Trim PREMIUM PACKAGE HD Radio Universal Garage Door Opener Heated Front Seat(s) Satellite Radio Power Door Locks Keyless Entry Premium Sound System PANORAMA SUNROOF Generic Sun/Moonroof Sun/Moonroof Dual Moonroof MULTI-MEDIA WITH SMARTPHONE Navigation System CD Player Back-Up Camera Bluetooth® Connection Entertainment System BLIND SPOT ASSIST Blind Spot Monitor *Note - For third party subscriptions or services, please contact the dealer for more information. * When you purchase a vehicle with the CARFAX Buyback Guarantee, you're getting what you paid for. Why does this vehicle look so great? The CARFAX report shows it's only been owned by one owner. Why own a car when you can own a lifestyle? We at Mercedes Benz of Massapequa offer you nothing less than the best with our Certified Pre-Owned vehicles. This vehicle meets Mercedes-Benz's highest level of standards, allowing us to provide you with what you deserve. Want more room? Want more style? This Mercedes-Benz GLA is the vehicle for you. The impressive Mercedes-Benz fuel-efficiency will make you quickly realize what you've been missing out on in life. It's noteworthy fuel economy and minimal emissions make this vehicle's value a cut above the rest. Simply put, this all wheel drive vehicle is engineered with higher standards. Enjoy improved steering, superior acceleration, and increased stability and safety while driving this AWD Mercedes-BenzGLA GLA 250. 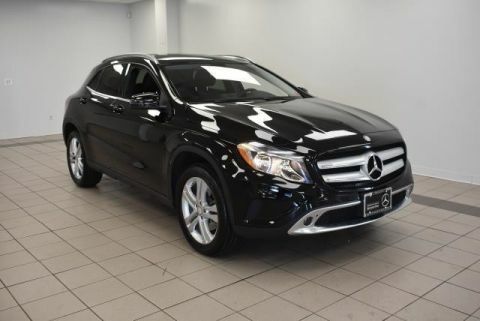 You can tell this 2016 Mercedes-Benz GLA has been pampered by the fact that it has less than 28,735mi and appears with a showroom shine. Treat your family to the joy of a vehicle with a super premium entertainment package like the one found in this vehicle. With an efficient and easy to use navigation system, this Mercedes-Benz GLA will help get you from Point A to Point B in no time flat. This finely crafted vehicle is engineered to last. But just in case it doesn't, you can take comfort knowing it comes with a manufacturer's warranty. More information about the 2016 Mercedes-Benz GLA: Mercedes-Benz enters the increasingly crowded luxury compact crossover segment with the GLA-Class. Its sedan underpinnings and small stature make it a nimble performer, with favorable comparison against competition from BMW and Audi. The high-performance GLA 45 AMG® takes things to a different level, however, and nothing from any manufacturer can rival it. Strengths of this model include athletic handling, superb power in AMG® guise, and Available technology and safety features Payments based on maximum finance term available and Tier 1 credit approval. 20% Cash or trade down. Tax,DMV additional. Thank you for your interest in one of Mercedes Benz of Massapequa's online offerings. Please continue for more information regarding this 2016 Mercedes-Benz GLA GLA 250 with 29,666mi. This Mercedes-Benz includes: PREMIUM PACKAGE HD Radio Universal Garage Door Opener Heated Front Seat(s) Satellite Radio Power Door Locks Keyless Entry Premium Sound System PANORAMA SUNROOF Generic Sun/Moonroof Sun/Moonroof Dual Moonroof MULTI-MEDIA WITH SMARTPHONE Navigation System CD Player Back-Up Camera Bluetooth® Connection Entertainment System BLIND SPOT ASSIST Blind Spot Monitor *Note - For third party subscriptions or services, please contact the dealer for more information. * This 2016 Mercedes-Benz GLA comes with a CARFAX Buyback Guarantee, which means you can buy with certainty. CARFAX shows that this is a one-owner vehicle -- no wonder it's in such great condition. This vehicle has met all the exacting standards to be classified Certified Pre-Owned. Off-road or on the street, this Mercedes-Benz GLA GLA 250 handles with ease. Save money at the pump with this fuel-sipping Mercedes-Benz GLA. No matter the weather conditions or terrain, this Cirrus White AWD Mercedes-Benz GLA handles with an elegant confidence. Fine interior appointments complement this vehicle's unprecedented performance. The GLA GLA 250 has been lightly driven and there is little to no wear and tear on this vehicle. The care taken on this gently used vehicle is reflective of the 29,666mi put on this Mercedes-Benz. What's the best way to keep your occupants occupied in this Mercedes-Benz GLA ? A full-featured entertainment system. It's included and ready to entertain. With an efficient and easy to use navigation system, this Mercedes-Benz GLA will help get you from Point A to Point B in no time flat. This finely crafted vehicle is engineered to last. But just in case it doesn't, you can take comfort knowing it comes with a manufacturer's warranty. More information about the 2016 Mercedes-Benz GLA: Mercedes-Benz enters the increasingly crowded luxury compact crossover segment with the GLA-Class. Its sedan underpinnings and small stature make it a nimble performer, with favorable comparison against competition from BMW and Audi. The high-performance GLA 45 AMG® takes things to a different level, however, and nothing from any manufacturer can rival it. This model sets itself apart with athletic handling, superb power in AMG® guise, and Available technology and safety features Payments based on maximum finance term available and Tier 1 credit approval. 20% Cash or trade down. Tax,DMV additional.Thank you for your interest in one of Mercedes Benz of Massapequa's online offerings. Please continue for more information regarding this 2016 Mercedes-Benz GLA GLA 250 with 29,666mi. This Mercedes-Benz includes: PREMIUM PACKAGE HD Radio Universal Garage Door Opener Heated Front Seat(s) Satellite Radio Power Door Locks Keyless Entry Premium Sound System PANORAMA SUNROOF Generic Sun/Moonroof Sun/Moonroof Dual Moonroof MULTI-MEDIA WITH SMARTPHONE Navigation System CD Player Back-Up Camera Bluetooth® Connection Entertainment System BLIND SPOT ASSIST Blind Spot Monitor *Note - For third party subscriptions or services, please contact the dealer for more information. * This 2016 Mercedes-Benz GLA comes with a CARFAX Buyback Guarantee, which means you can buy with certainty. CARFAX shows that this is a one-owner vehicle -- no wonder it's in such great condition. This vehicle has met all the exacting standards to be classified Certified Pre-Owned. Off-road or on the street, this Mercedes-Benz GLA GLA 250 handles with ease. Save money at the pump with this fuel-sipping Mercedes-Benz GLA. No matter the weather conditions or terrain, this Cirrus White AWD Mercedes-Benz GLA handles with an elegant confidence. Fine interior appointments complement this vehicle's unprecedented performance. The GLA GLA 250 has been lightly driven and there is little to no wear and tear on this vehicle. The care taken on this gently used vehicle is reflective of the 29,666mi put on this Mercedes-Benz. What's the best way to keep your occupants occupied in this Mercedes-Benz GLA ? A full-featured entertainment system. It's included and ready to entertain. With an efficient and easy to use navigation system, this Mercedes-Benz GLA will help get you from Point A to Point B in no time flat. This finely crafted vehicle is engineered to last. But just in case it doesn't, you can take comfort knowing it comes with a manufacturer's warranty. More information about the 2016 Mercedes-Benz GLA: Mercedes-Benz enters the increasingly crowded luxury compact crossover segment with the GLA-Class. Its sedan underpinnings and small stature make it a nimble performer, with favorable comparison against competition from BMW and Audi. The high-performance GLA 45 AMG® takes things to a different level, however, and nothing from any manufacturer can rival it. This model sets itself apart with athletic handling, superb power in AMG® guise, and Available technology and safety features Payments based on maximum finance term available and Tier 1 credit approval. 20% Cash or trade down. Tax,DMV additional. 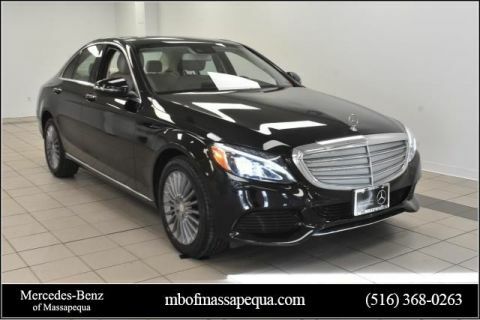 Mercedes Benz of Massapequa has a wide selection of exceptional pre-owned vehicles to choose from, including this 2016 Mercedes-Benz C-Class. This Mercedes-Benz includes: HEATED FRONT SEATS PANORAMA SUNROOF REAR VIEW CAMERA MULTIMEDIA PACKAGE PREMIUM 2 PACKAGE BLIND SPOT ASSIST HEATED STEERING WHEEL Heated Steering Wheel *Note - For third party subscriptions or services, please contact the dealer for more information. * This 2016 Mercedes-Benz C-Class comes with a CARFAX Buyback Guarantee, which means you can buy with certainty. This vehicle is Certified Pre-Owned. The Mercedes-Benz C-Class C 300 Sport's pristine good looks were combined with the Mercedes-Benz high standard of excellence in order to make this a unique find. Save money at the pump with this fuel-sipping Mercedes-Benz C-Class. 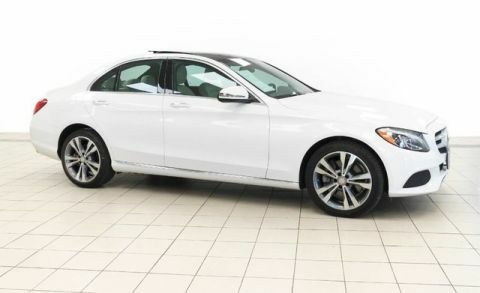 Take home this 2016 Mercedes-Benz C-Class and enjoy the safety and added performance of AWD. This 2016 Mercedes-Benz C-Class has such low mileage it has been parked more than driven. Price. Performance. Protection. This vehicle has it all, including a manufacturer's warranty. Left your phone at the restaurant? No problem. With the navigation system on this Mercedes-Benz C-Class, you'll be able to quickly find your way back to get it. More information about the 2016 Mercedes-Benz C-Class: The C-Class has traditionally been Mercedes-Benz' entry-level car. However, with the arrival of the CLA, the C-Class is no longer the German automaker's least expensive model. Mercedes-Benz has packed the 2016 C-Class full of upscale technology, determined to make the car feel anything but entry level. Despite this move upmarket, pricing on the C-Class remains competitive with other European small sedans such as the BMW 3-series. The 2016 C-Class starts at around $40,000. This model sets itself apart with high-end features, all-wheel drive, Attractive modern styling, fuel-efficient diesel and hybrid engines, plus powerful turbocharged engines, and typical Mercedes-Benz luxury Payments based on maximum finance term available and Tier 1 credit approval. 20% Cash or trade down. 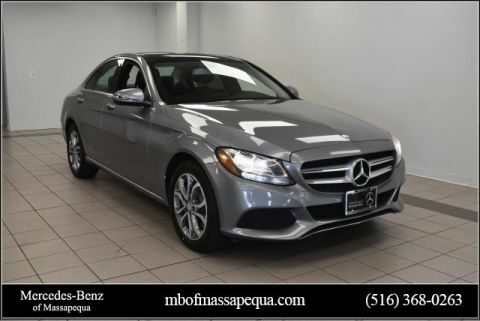 Tax,DMV additional.Mercedes Benz of Massapequa has a wide selection of exceptional pre-owned vehicles to choose from, including this 2016 Mercedes-Benz C-Class. This Mercedes-Benz includes: HEATED FRONT SEATS PANORAMA SUNROOF REAR VIEW CAMERA MULTIMEDIA PACKAGE PREMIUM 2 PACKAGE BLIND SPOT ASSIST HEATED STEERING WHEEL Heated Steering Wheel *Note - For third party subscriptions or services, please contact the dealer for more information. * This 2016 Mercedes-Benz C-Class comes with a CARFAX Buyback Guarantee, which means you can buy with certainty. This vehicle is Certified Pre-Owned. The Mercedes-Benz C-Class C 300 Sport's pristine good looks were combined with the Mercedes-Benz high standard of excellence in order to make this a unique find. Save money at the pump with this fuel-sipping Mercedes-Benz C-Class. 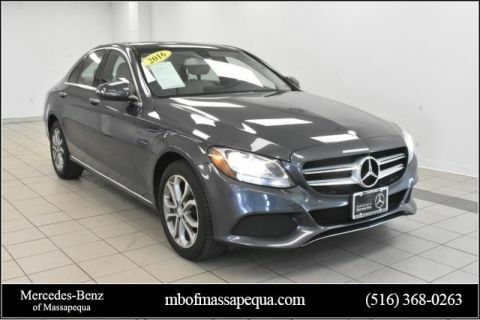 Take home this 2016 Mercedes-Benz C-Class and enjoy the safety and added performance of AWD. This 2016 Mercedes-Benz C-Class has such low mileage it has been parked more than driven. Price. Performance. Protection. This vehicle has it all, including a manufacturer's warranty. Left your phone at the restaurant? No problem. With the navigation system on this Mercedes-Benz C-Class, you'll be able to quickly find your way back to get it. More information about the 2016 Mercedes-Benz C-Class: The C-Class has traditionally been Mercedes-Benz' entry-level car. However, with the arrival of the CLA, the C-Class is no longer the German automaker's least expensive model. Mercedes-Benz has packed the 2016 C-Class full of upscale technology, determined to make the car feel anything but entry level. Despite this move upmarket, pricing on the C-Class remains competitive with other European small sedans such as the BMW 3-series. The 2016 C-Class starts at around $40,000. This model sets itself apart with high-end features, all-wheel drive, Attractive modern styling, fuel-efficient diesel and hybrid engines, plus powerful turbocharged engines, and typical Mercedes-Benz luxury Payments based on maximum finance term available and Tier 1 credit approval. 20% Cash or trade down. Tax,DMV additional.